View of part of King's College and Clare College at Cambridge from the lawn. 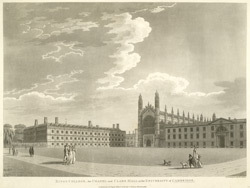 In the middle are the soaring towers of the west façade of King's College Chapel. To the right is the west façade of King's College's Gibbs Building. The grass courtyard provides a good setting from view to admire the two buildings. The Chapel was built between 1446 and 1515 and is a magnificent example of a late medieval Royal Chapel, in the Gothic Perpendicular Style. The Gibbs building was erected in the 1720s and is a plain modification by James Gibbs of a grand baroque design by Nicholas Hawksmoor. To the left is the west range of Clare College which was built in 1671 . This lawn leads down to the river and college meadows.